A pair of snap ring pliers are the only hand tool that will handle snap ring components. The five best snap ring plier sets, compared and reviewed. A pair of snap ring pliers are a stand alone hand tool, much like a socket wrench. They're designed for one purpose only - dealing with snap rings. There isn't another tool on the market that can handle these small metal components and they're near impossible to remove with the use of a pair of specialist split ring pliers. Generally they resemble an average pair of pliers, differing in the action that either removes or pushes a snap ring. They're a sturdy tool, built to withstand the torque and maneuvering required when faced with snap rings - and a good pair will stand the test of time. The five best examples of snap ring pliers are featured below. They're all in the best selling list, offer a good return on investment are are highly rated hand tools overall. 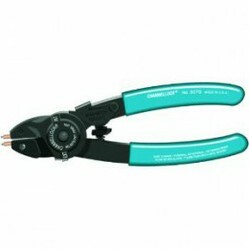 These snap ring pliers are five star rated and will work with both internal and external snap rings. They're easy to adjust, a simple maneuver of a pair of sliders alters the perspective and the overall design is comfortable in-hand and gives a good solid grip. Manufactured from hardened steel, they're a breeze to use - removing snarled up snap rings and replacing them is straight forward enough, the grip is stable, swapping the tips wasn't a difficult task and I ended up with a good finish with no real issues. USA made, additional tips, a nice flexible hand tool - on offer at a discount that makes them well worth the price tag. This is a good quality snap ring pliers set and will set you back less than 30 bucks for the whole collection. It's comprehensive enough and worth buying if your job brings you into contact with a whole load of snap rings. There's enough flexibility with the set, which includes a set of four different sized bend and straight pliers, plus a pick and a useful hook. They're all manufactured from hardened steel, dipped comfort grip handles and house in a good quality case that's sturdy enough to transport around. It's designed for the most common snap ring pliers - it won't deal with heavy duty stuff and if that's what you need, you're better with a higher quality and more expensive set. That said - good entry level set, does what it says on the box and decent quality for the price. Less than 10 bucks will buy you this good, solid snap ring pliers tool that's pretty durable on the whole, well made, good design and up to handling a good array of internal snap rings. The handles are dipped, the grip is good enough when you're applying the torque or maneuvering around to get the initial grip on the snap ring and the mechanics of the tool are impressive for the price tag. Solid hardened steel construction, it comes with a set of 5 interchangeable points and will do what you need it to do. As a stand alone hand tool, it's good quality, easy to use - and replacing the points requires the use of a hex key - size 5/64". Reliable tool, cheap enough and good enough. This is a large snap ring pliers set that's a high end manufacture, and designed for dealing with the bigger snap rings you'll come up against. It will handle external snap rings from 3-1/2" to 7" and internal rings that range between 3-1/2" to 7". It's made from tough stuff - even the hardware is made from heat treated alloy steel and the case is a plastic blow molded rugged design. It comes with five different interchangeable tips, the required hex key needed for changing them and a handy pouch to contain the tips. It's as solid as it looks, makes short work of mangled snap rings and the price more than reflects that quality of its design and manufacture. This is another of the best selling retaining snap ring pliers and at under 20 dollars for the kit, it's worth the purchase price if you're looking for a set that will handle a fair range of internal and external snap rings. The manufacture of the set is awesome for the price - the steel construction is heat treated chromium-molybdenum (which means it's incredibly durable) and and the handles are an insulated vinyl - good grip, comfortable to work with. There's a collection of ten different sized pliers, four bend and four straight, a hook and pick and a case to keep them all together. Good quality, comparable to the 11 Snap Ring set - only cheaper and likely the better choice of the two. The Dremel Muli-Max oscillating tool has lots of different uses, but I'm a doll collector and needed a sander to smooth old dollhouse walls. I'm so happy with it I have to share. There's nothing like a good quality portable workbench when it comes to extra workspace. The five best foldable workbenches compared and reviewed.